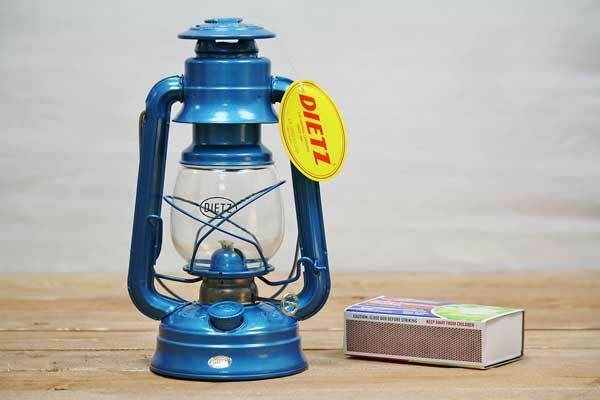 Released in 1978 the Dietz #76 Original Hurricane Lantern was designed after a popular German-made variety. Select from five vintage colors and styles. This lantern features a unique left-handed globe lever for making wick-lighting easy. Use for ambient or emergency lighting inside or out on the porch. Rustic lighting for restaurant tables. This Dietz hurricane lantern, named appropriately for its resistance to high wind, is ready for any adventure or emergency. Safe and economical to operate. They burn an average of 2 cents of lamp oil each hour. You'll be working by the light of a lantern even when the power is on! Made by Dietz Lantern Company. Looking for something smaller? View our 8.5" tall dietz comet lantern. Parts of a kerosene lantern Fundamentals of lantern construction What is a hurricane lantern? What type of fuel to use in old fashioned lanterns? How to fill an oil lantern with oil How do you light a lantern? The differences of Dietz and V&O lanterns Where are Dietz Lanterns made? Where are V&O Lanterns made?